President Trump's warm words for Vladimir Putin and his failure to endorse U.S. intelligence community claims about alleged Russian meddling have been called "treasonous" and the cause of a "national security crisis." There is a crisis, says Prof. Stephen F. Cohen, but one of our own making. Stephen Cohen is an American scholar and professor emeritus of Russian studies at Princeton University and New York University. His academic work concentrates on modern Russian history since the Bolshevik Revolution and the country's relationship with the United States. Cohen is married to Katrina vanden Heuvel, editor of the progressive magazine The Nation, where he is also a contributing editor. Cohen is also the founding director of the reestablished American Committee for East–West Accord. Two very interesting interviews on the Trump-Putin meeting. While in the hospital I was astounded at the non-stop rabid demonization on the TV news channels of the Helsinki meeting. By now you'd think that I can't be surprised anymore. The perpetrators of the corporate takeover in Washington fuzzy up their 'full spectrum dominance', 'peace thru strength', agenda by distracting the public using the current 'Russians are coming' campaign. Trump acknowledged the slight of hand himself recently when he hollered at the media, 'It's all a show', in reference to his talks with Kim in North Korea..
Russia has huge borders (likely a gift and a curse at the same time) and are accused of being aggressive when they try to stabilize the chaotic situation as the US-NATO gobble up new 'members and partners' and complete the provocative encirclement of Russia and China. Tucker Carlson asks Russian expert Stephen Cohen if the US wants a war with Russia. It sure looks that way to me. The Democrats in the US are leading the wolf pack to war. Why? Both corrupt parties (it was the mob vs the mafia in the last election) are feuding for power - the Repubs and Dems represent various factions of the corporate oligarchy. They will use any issue they can to try to retake power without ever 'fixing' our broken society because doing that would work against their dastardly plan to bring back feudalism. Trump knows the TV wrestling working class crowd quite well. He used them to ride into office (like the way Obama used the peace issue) and has convinced them he is on their side about the need for jobs, security and dignity. The Repubs and Dems agree on the strategy to fleece the American people and massively increase military production which is being aimed at China and Russia. The liberal politicians are fascinating to watch - they presume they are allies of people like me but are doing the very things we speak out against.... build for more war, allow Pentagon to eat the budget for human needs, ignore climate change and the toxic legacy of industrial capitalism). The key things that I want to know include why are so many 'progressives' buying the hate Putin/Russia mantra? Can't they see 2003 'shock and awe' all over again? The US is desperate - is loosing it's control of the planet and is striking back with all it knows - its military bluster. Russia, China, Iran, North Korea and others are demanding that the days of Pax Americana be over. The worst of the bunch is Sen. Chuck Shumer (D-NY). In one moment he defends a woman's right to choose and in the next breath is banging the war drum. Both parties keep running their 'wait until the next election' carrot out to a frustrated public. One shouldn't sit idly by in the face of corporate control. 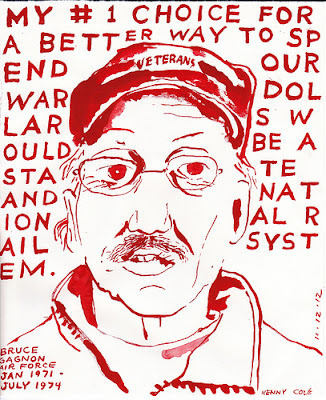 Our biggest need right now is for people to show some courage and stand up against more US warmongering. Endless war is the rotted root of American exceptionalism. I got home today just before noon. 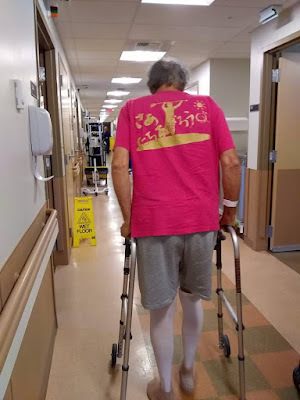 Seem to be doing quite well according to physical therapy and the doctors at the Veterans Administration (VA) hospital here in Maine at Togus. So far I'm not needing so many pain pills either. The care I received at the VA was exceptional. I had some great political discussions with various folks while there and the topic of 'privatization of the VA' repeatedly came up. It is so unfair that everyone does not have access to such good quality health care. We should each be demanding 'Medicare for all'. Still much work to be done to get my 'new' knee into shape - it's going to take time and I am not the most patient person around. This process will be humbling for me as my leg teaches me to slow down and do a bit more exercises everyday. Thanks for all the thoughts, prayers and good wishes from so many. Early on Monday morning I will be put under sedation in order to have my knee replacement surgery. The doctors say I would be in the hospital 2-3 days. I've heard they get you up soon after the operation is over to begin the physical therapy process. So they will want me to be pushing myself to move my leg. I obviously won't be able to post here for awhile. I'm posting a backlog of items in order to keep readers a bit busy until I return. Please send me your healing vibes on Monday morning. Pray for world peace and equality. See if you can make it all happen before I return! If we are going to survive the ravages of climate change then all the world's militaries must be converted to do things like this. It is our primary hope for survival of the future generations. The military carbon bootprint is the biggest contributor to global warming. Years ago at the time of the signing of the Kyoto Protocols in 1997 (Bill Clinton's time as president) the US refused to sign the accords unless the Pentagon's contribution to climate change was excluded and kept as a state secret. In 2005 (during the reign of George W. Bush) the protocols became active. Since that time the US continues to disallow its military environmental impact to be publicly known. This kind of attitude of secrecy and determination to maintain the fossil fuel addiction in our country only hastens our collision with climate change. Let's instead call for the conversion of the war machine. Learn more about the issue, talk more about it, ensure that our local organizations connect all the dots between war and peace, climate change, growing global poverty and the surveillance society. The corporations see the writing on the wall and they are grabbing everything they can with no concern for the public. We have to demand fundamental systemic change. I've long asked, "What is the #1 job of a human being on Earth today?" My own answer to the question is that we must work to ensure the survival of the coming generations of humans, plants, animals, water, air and other life forms. Thanks to China for taking these steps toward the 'Natural Guard'. Please keep showing this kind of leadership and illustrating how military resources, which are currently wasted, could be used in a better way. What and who do U.S. military bases represent? This video is by Iraq and Afghanistan wars veteran Will Griffin. Besides doing great work on The Peace Report, Will also serves on the board of the Global Network Against Weapons and Nuclear Power in Space. Be sure to 'like' Will's video, share it, and consider supporting him on Patreon. New York to Donetsk and back from Russian Hour on Vimeo. This is a wonderful film about the Donetsk Peoples Republic (DPR) ....which is being shelled daily by the neo-Nazi government in Kiev, Ukraine. DPR is the Russian-speaking eastern region of Ukraine near the Russian border that has been continuously under attack since the 2014 US directed coup d' etat in Kiev. At that time the first thing the new US puppet government in Kiev did was to ban the speaking of Russian in Ukraine. Hello! This film is a must watch for anyone with a sliver of objectivity left about all things Russian and Ukraine. I promise you will learn a whole lot watching this good, and at times, heart breaking story.